A variety of different keys. A key is a physical object that is used to open a lock. Keys are inserted into a lock to cause internal components to align, allowing the lock to open. In electronic locks, keys may transmit information electronically rather than manipulate physical components. Some keys are patent protected to prevent unauthorized manufacturing of keyblanks. Because of their use, keys have become symbolic of knowledge, power, responsibility, and trust. Keys have been used in countless pieces of art and literature throughout history, especially in religion. The papal insignia and the symbol of St. Peter are two such examples. The part of the key that makes contact with internal components. Cuts on the bitting allow internal components to be moved to different positions. The shaft of the key which holds the wards, bitting, and cuts. The handle which is used to turn the key. Commonly contains the lock manufacturer's logo, the keyway type, and key codes. Bows are generally patented, allowing keys to be quickly associated with certain manufacturers. Characters stamped on the bow of the key that define what the cut depths for the key are or what model the keyway is. Some keys stamp the exact bitting code on the bow to facilitate key duplication. Others obfuscate the code and require software or a codebeook to decipher the bitting code. These are known as direct and indirect key codes, respectively. The cuts made on the bitting of the key. Cuts are used to properly align internal components of the lock, allowing the key to actuate the locking mechanism and unlock the lock. The profile of the key created by the blade and the wards. This is the inverse of the keyway of the lock. The part of the key that connects the bow to the blade. The shoulder is commonly responsible for stopping the key from being inserted further, allowing the cuts to be properly aligned in the lock. The end of the key opposite of the bow. Some locks use the tip of the key to align cuts instead of the shoulder. Distortions to the blade of the key to prevent it from being used in a lock with a different keyway. Warded locks use this as their primary means of security. The traditional key with one set of cuts on the bitting. A key with several sets of cuts, thus giving them multiple bitting surfaces. Common in high security locks that have auxilliary locking mechanisms, such as a sidebar. A key with duplicate cuts but only one actual bitting surface, allowing the key to be functional when inserted in any orientation. A key that has four bittings, giving it a star shaped tip. May not actually use all four, like a convenience key. A key that has an electronic transponder in the bow of the key that transmits a code to a receiver in the lock. Most commonly seen in automotive keys. Requires specialized equipment to copy. A special type of automotive key that can be used by a valet driver. Typically, a valet key can operate the doors and ignition of a car, but can't open the glove compartment or trunk. A key that has had no bitting cuts applied to it. "Blanks" are a common locksmithing item used for duplicating keys, impressioning, and creating bump keys. Non-electronic keys are made with aluminum, brass, iron, nickel-silver, steel, or zamak. The material used depends on the type of lock and the required durability and longevity of the key. 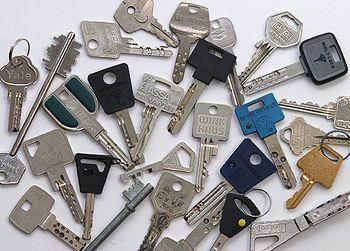 Most keys are duplicated using a key-cutting machine. These machines can copy a key using a working key or by inputting the bitting code of the desired key. Manual key copying machines are available but uncommon. Many key machines use the original key as a template to control the cutting mechanism to duplicate the bitting onto a blank key. Key machines, regardless of duplication method, include one or more cutting wheels and a deburring wheel to clean and smooth the edges of a newly-cut key. The compromise of a key or keying system may constitute a serious vulnerability in a locking system. Keys that are examined, borrowed, or stolen can be impressioned or decoded. Analysis of keys within a master system may also contribute to compromise of the overall system, depending on the specifics of the system and the key obtained.